Kigoma Region is one of Tanzanias 30 administrative regions. The regional capital is the city of Kigoma. According to the 2012 national census, the region had a population of 2,127,930, which was higher than the pre-census projection of 1,971,332. For 2002-2012, the regions 2.4 percent average annual population growth rate was tied for the fourteenth highest in the country. It was also the sixteenth most densely populated region with 57 people per square kilometer. With a size of 45,066 square kilometres (17,400 sq mi), the region is slightly smaller than Estonia (45,227 square kilometres (17,462 sq mi)). Kigoma Region resides in the northwestern corner of Tanzania, on the eastern shore of Lake Tanganyika. The region lies at about 5° south and 30° east of Greenwich. The region is bordered to the north by both Burundi and the Kagera Region. To the east, it is bordered by the Shinyanga and Tabora regions, to the south by the Rukwa Region, and to the west by Lake Tanganyika, which forms a border with the Democratic Republic of the Congo. The regions total area is 45,066 square kilometres (17,400 sq mi), of which 37,037 square kilometres (14,300 sq mi) is land and 8,029 square kilometres (3,100 sq mi) is water. The regions total area is just 161 square kilometres (62 sq mi) less than that of Estonia. As of 1998, approximately 20,000 square kilometres was in forests and 12,000 square kilometres was suitable for grazing or farming. Kigoma Region is on a plateau that slopes from the northeast at about 1,750 meters down to 800 meters at the shore of lake Tanganyika. The topography in the north and east is gently rolling hills that gradually become steeper as they get closer to the Albertine Rift margin. The most important river is the Malagarasi, with the Luiche and the Ruchugi being the two other major rivers draining the region. In precolonial Africa the region was a source of ivory and slaves. Tabora and Ujiji were Arab staging areas for shipments to the coast. It was visited by the early European explorers Richard Burton, John Speke, David Livingstone, and Henry Morton Stanley. 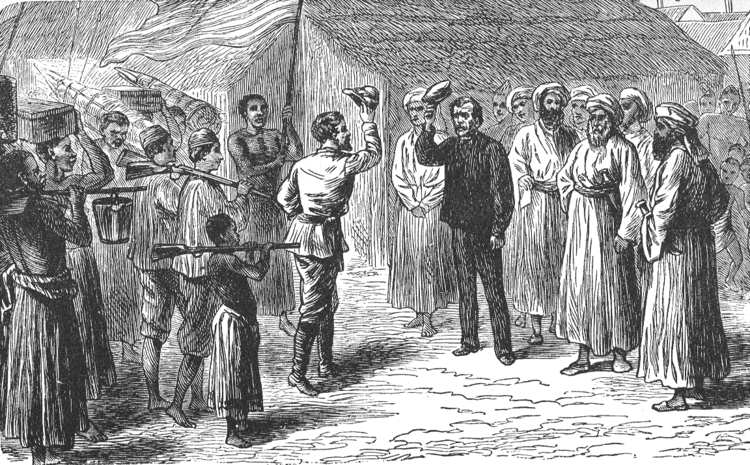 In fact, Stanley met Livingstone in Ujiji on the shores of Lake Tanganyika on 27 October 1871. In colonial times, the Kigoma area was known as the Western Region and the capital was Tabora.